The most important thing I could ever testify of is Jesus Christ. 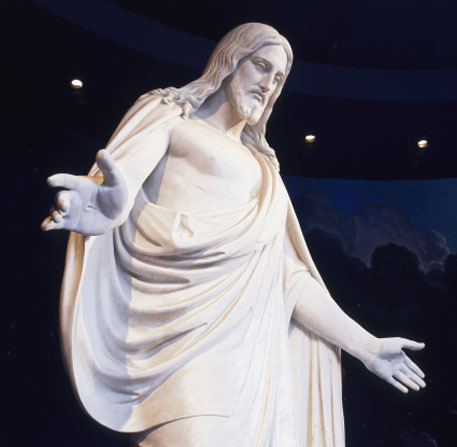 In the year 2000, the First Presidency and the Quorum of the Twelve Apostles of the Church of Jesus Christ of Latter-day Saints published a document called "The Living Christ." It tells the things we believe about Jesus Christ, and I could just say "Go read that, and imagine me saying, 'Amen.' and that's my testimony." But I want to share in my own way. There is a beautiful hymn by James Allen called "Glory to God on High" and it echoes my testimony of Jesus Christ. Let heav'n and earth reply. His love and grace adore. Jesus knew that because we are mortal and human, we would sin and make mistakes, and we would no longer be worthy to have our greatest hope: to live in God's presence. We would be shut out forever, cold and sad and lonely and miserable. But because of His love for us, His desire to see us happy, He offered to take upon Himself our sins, to bear the shame and punishment for us, even to the point that He, who was perfect and innocent, would suffer and die. Jesus said, "Greater love hath no man than this, that a man lay down his life for his friends." (John 15:13). His sacrifice was more than just washing away our sins. Faith in Him helps us to get through our day-to-day trials and to do God's will, even though we are still just as human and prone to mess up as ever. He promises us His Grace, which is not only His taking upon Himself our sins, but also giving us His strength and assistance to live as God commands. We couldn't be able to keep up doing that if we were left to ourselves. We would mess up, slip up, give up. His Grace enables us to get up and keep going. Who all our sorrows bore / bore sin’s tremendous load. Sometimes things in life make us sad. We are separated from friends and family, or we have fights or our bodies get sick or just hurt. Or we realize we have sinned yet again and feel sad and stupid for the things we've done. Jesus bore those pains for us, too. One of the most beautiful passages in the Book of Mormon says of Jesus, "And he shall go forth, suffering pains and afflictions and temptations of every kind; and this that the word might be fulfilled which saith he will take upon him the pains and the sicknesses of his people. And he will take upon him death, that he may loose the bands of death which bind his people; and he will take upon him their infirmities, that his bowels may be filled with mercy, according to the flesh, that he may know according to the flesh how to succor his people according to their infirmities. Now the Spirit knoweth all things; nevertheless, the Son of God suffereth according to the flesh that he might take upon him the sins of the people, that he might blot out their transgressions according to the power of his deliverance" (Alma 7:11-13). Elder Merrill J. Bateman of the Quorum of Seventy once said the following about the Atonement of Jesus Christ that has stuck with me ever since, and has made me love Jesus Christ even more: “For many years I thought of the Savior’s experience in the garden and on the cross as places where a large mass of sin was heaped upon Him. Through the words of Alma, Abinadi, Isaiah, and other prophets, however, my view has changed. Instead of an impersonal mass of sin, there was a long line of people, as Jesus felt “our infirmities” (Heb. 4:15), “[bore] our griefs, … carried our sorrows … [and] was bruised for our iniquities” (Isa. 53:4–5). The Atonement was an intimate, personal experience in which Jesus came to know how to help each of us.” (Merrill J. Bateman, A Pattern for All, October 2005).Suddenly, I can picture myself in that line, and there must be billions and billions of people, each of us carrying a heavy bag, some big, some small, of pain and sin and sorrow. I am ashamed enough of my own bag, but to have to wait in that long, long line—can you imagine how long it would take?—to bring it to Him and dump it on His already tired shoulders, and yet He still smiles at me and reaches out to love and embrace me! Tell what his arm hath done, what spoils from death he won. There isn’t room to tell of everything Jesus has done. How He, under the direction of Heavenly Father, created this world for us to live on. How He healed the sick and taught and loved and comforted so many people. How He blessed the little children. How He established His church on the earth and brought it back in our day after so much of it had been lost for centuries. How He has led and guided prophets all through the ages, from Adam to Thomas S. Monson today. It used to be, when two nations went to war, whatever side won got to ransack the homes of the losers and keep anything they found. They called those things they claimed “the spoils of war”. Jesus fought a war with death and won, and the things that Death owned that Jesus gets to keep is US. Because Jesus rose from the dead, those of us who are subject to death belong to Him, to do with us whatever He wants. And remember how much He loves us and wants to give us our greatest desire: to live with God? That’s what he plans to do with us! To him ascribed be Honor and majesty. “Ascribed” means “use these words to describe someone.” The words “honor” and “majesty” perfectly describe Jesus Christ. He is full of honor—He is always perfectly obedient to Heavenly Father, perfectly honest, perfectly selfless, never selfish. And majestic, oh so majestic—full of dignity and kindness and power and royalty and glory. Of all the things I could testify—and there are many—I know that Jesus truly is the Christ, the Son of God, not only the Savior of the World, but the Savior of me. This hymn is meant to be sung “Joyfully” and that is how I feel. Grateful. Humbled. Beloved. Blessed to have the fullness of the Restored Gospel in my life and to know that the Book of Mormon is true and that we are led by living prophets in our day. But most of all, so happy to be called His.